Its been a while i was searching for a cheap wifi module and with the help of smart-prototyping.com, i was able to get a module almost less than USD 5. To connect the module to breadboard for prototyping, i made a small jig to interconnect with the board easily. So i can wire up the device and interface anything to GPIO’s. Be careful with the module cause the device it powered with 3.3V and both UART side levels will be 3.3V so i recommend to use a FTDI converter with 3.3V level select. (one i used can select 3.3 and 5 volts) if you connect 5V the module will fry up. If you have 5V or 12V supply to power up the module i suggest to use LD1117V33 to make 3.3V. 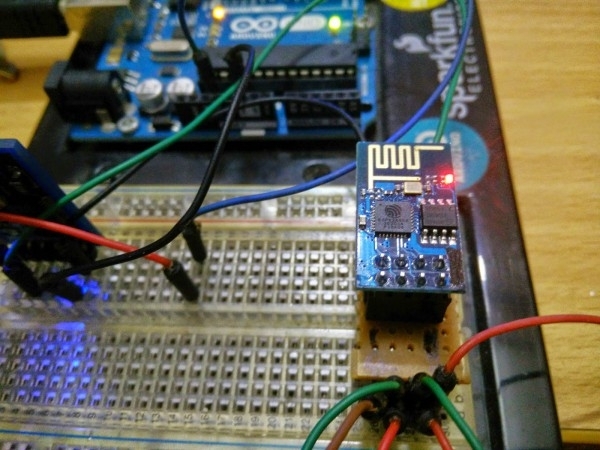 The stock Firmware in the ESP8266 supports AT commands and for communicating with this need an micro-controller like Arduino. But i want to make a simple solution for that without using external micro-controller. NodeMCU firmware was the best thing i found. To upload the NodeMCU firmware please do a google search, there are tons of video’s and supporting documents out there. I am not going to explain the flashing in this post. NodeMCU is Lua based firmware and i hope most of the people will know it. Most router GUI also built by Lua. If you are done with the flashing the ESP8266 module, lets connect the DS18B20 to GPIO 0. If you are not aware of pin mapping please check it before connecting anything to the module. Before writing any code, goto thingspeak.com and make an account and get the API key which will be used with the Lua code.